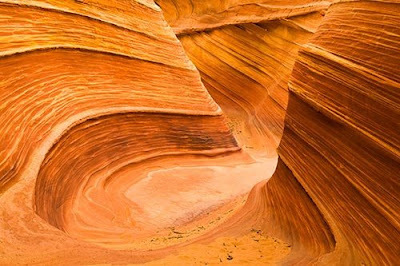 The Wave is a few hundred yards across the border into Arizona, but you have to start in Utah to get there. I went in from Wire Pass Road. The location used to be actually kinda secret. Now the BLM admins this land at the rather shaky permission of the local Navajos. Only small groups can travel there. Cannot disturb delicate ecosystem, or sacred ground, or something like that depending who ya ask. Anyway when I went there I sneaked in off season. The area was closed for winter and all the teepees were rolled up for the winter or something. I hiked in across the top of the mesa off trail, not supposed to do that. Found some nice wood and arrow points along the way. No tracks or people, very nervous about that. Lots of desert ravens. I think they know something. But not telling. Anyway, I came into the Wave formation from the side, and hiked out on the little trail. It's beautiful, like nothing you have ever seen. I had quite a time finding a down-climb. Long way to travel. Between Kanab and Page. Near Buckskin Gulch on the Paria Canyon. 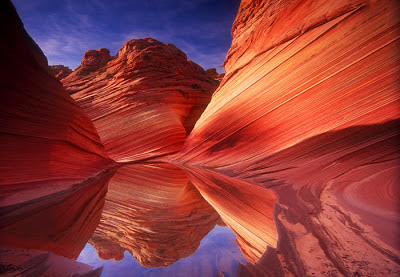 Vermillion Cliffs Wilderness/Coyote Buttes area. For those who prefer a legal visit, the BLM hands out the permits. I saw this exact photo on the wall at the hospital. I told Darrin that if anyone could tell me how to get there, you could. I knew you would have been there. I've been wanting to go to the wave for a long time. We'll have to discuss more details so I can take my family before we move away, ok? Normally, to make a formal visit there takes special advance preparation. If you are serious, I'd start making inquiries right now. You might still be able to get reservations in for this year. Or you can just try dropping by, and take your chances. Or you can sneakin illegally, like I did, but I don't think you guys want to try that. I would not do it again, under present circustances. I think it's okay to take your dog, so that's probably not a problem. You probably have to hire a guide and there is considerable expense, so consider whether it's better just to lokk at pictures. Theres probably lots more good info on the web that you can google for. Dig in! Just getting there is easy. Between Page and Kanab on the big hill is a turnoff dirt road into an area called Coyote Hills or something like that. The road is name Wire Pass Road. I can show you on my topo map. You go south for a few miles to a sort of old mining area. Thats where I parked. Further south is a BLM trailhead and trail register and outhouse, but I always stay away from places like that. Anyway, the trailhead follows the sandy bottom generally west meander for a short ways, then there is a branch to the south that leads over the mesa to the wave slot canyon leading south, or if you continue west you end up joining with Buckskin Gulch, and eventually, the Pariah River. For any who are following the news about deaths in this area, take heed of the warnings. Though local resources are more than adequate, they are not always easy to get at, and the desert heat can range almost beyond belief. Always be prepared. That said, it is also worth emphasising that this whole Paria Canyon complex is a geological wonder worth braving the risks, just to witness it with your own eyes.